The largest model trains are referred to as G gauge, rather G scale. This size of train is ideal for building a railroad through your garden or landscaping, though you can use it inside if you have enough space. They may cost more than smaller trains, but G gauge allows you to have a lot of fun designing a track while integrating a variety of natural scenery and features into the layout. Why do modelers refer to HO, O, or N scales but G gauge? In all of these other scales, most trains run on a common gauge of track, but all share a common scale or proportion to the prototype. With G gauge trains, only the gauge (width of the track) is common. The scales of the trains themselves can vary from 1:20.3 to 1:32. The reason for this is due to the variances in manufacturing G gauge trains. Some manufacturers make their models a slightly larger scale so the track is more narrow in gauge in relation to the size of the model. G Gauge is among the most popular choices for narrow gauge modeling. Models scaled so that the 45mm gauge is scaled to standard gauge are also called No. 1 scale, or 1:32. One of the most popular uses of G gauge trains is outdoor garden railroads. The track and structures are rugged enough to survive outdoor climates all year long. Most modelers keep the trains stored inside for security and protection when not in use, though. Building a garden railroad involves very different construction methods than indoor layouts. Grading the right of way, wiring, and planting scenery all take on new meaning. There are also the problems most indoor railroaders don't normally worry about, such as erosion and animals. For all of the added challenges, there are many advantages to garden railroading. It combines all of the joys of model trains with the hobby of gardening. For those who enjoy spending time outdoors, a garden railway is a unique home improvement and conversation piece. Of course, G gauge trains are perfectly at home inside as well. 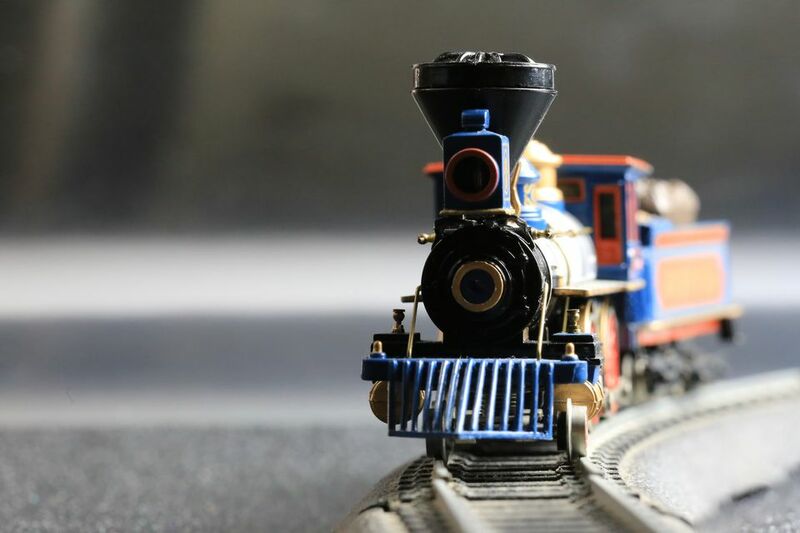 If you are considering G Gauge trains for your model railroad, there are a few key points you'll want to keep in mind. For garden railroads, it also helps to do a little more advanced research at a local home and garden center to find out which plant varieties will work best in your climate. Availability: While not as common as HO, N, or O scale trains, G gauge trains are available at most hobby shops and through mail order. A good variety of North American and European models are marketed. Even though many manufacturers do not build models to the same scale, the differences in size are often acceptable. They also tend to have compatible couplers, so all will work together. Cost: G gauge trains tend to cost more than smaller scales. Not only are you buying bigger models, generally you are buying models that are much more durable. These trains, track, and structures must be designed to survive direct sunlight, rain, and snow, so they are made of stronger plastics. A basic starter set will cost about $300 to $500. Keep in mind, though, that with larger trains comes a need for fewer models; G gauge railroads often focus on quality over quantity. Children: With their large size and rugged construction, G gauge trains are a popular choice for children. Indeed, kids will have little trouble handling these sturdy models. The only major drawback is the cost, which may be too much if there is any doubt that your child is going to really make the most of it. If you're buying your child a train on the hunch that they might want one, consider a more inexpensive scale, or start with other train toys first. On the other hand, if you know you have a dedicated young engineer, this could be the best $300 you ever spend on their hobby. Space: Despite their large size, many G gauge trains are designed to negotiate very tight curves. Depending on which models you choose and how much compromise you are willing to make, a respectable G gauge layout can be built indoors on platforms normally sized for smaller trains. For outdoor layouts, the sky is literally the limit. Just as with indoor layouts, however, access to track for maintenance is always a concern. Can You Combine Trains from Different Manufacturers?